A cute pet care game in which you’ll have to show your animal keeping talents! Take care of your dog, that, when it comes to live at your place, is only a little puppy. Feed it and play with it, so that it will have a good time, and will grow. Since it is a young animal, you can’t teach it that much yet. In the second level your dog is a full-grown dog and you can teach it all kind of things: it really likes to learn a lot. 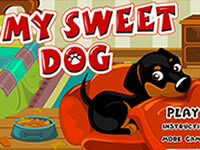 In the third level your dog is again a bit older, but you can still play with it and take care of it. If you train your dog well, your wall will be filled with lots of beautiful pictures of your four-footed friend!